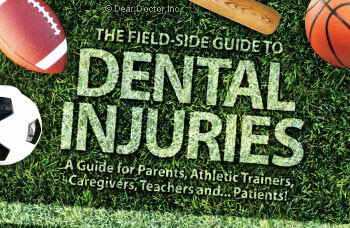 A Guide for Parents, Athletic Trainers, Caregivers, Teachers and... Patients! The person least likely to be present when a sports injury occurs is a dentist. To every parent, caregiver, coach, school nurse or other bystander, and of course, potential patient, every injury is urgent. Ideally, treatment will take place as soon as possible but there may not be a dentist nearby or the injured party may be away from home. In any event, your dentist, oral surgeon or pediatric dentist is the first line of defense. Even from an emergency room, a call to your dentist relating the exact nature of the injury or trauma to the teeth will result in a decision regarding what needs to be done and just how urgently appropriate care is needed. For purposes of discussion and clarity, time lines have been suggested related to the type of injury and treatment needed, however it is your dentist who should make that decision. Immediate — Within 5 Minutes: A tooth completely avulsed (knocked out of socket) requires treatment immediately to have any chance of saving the tooth long term. Urgent — Within 6 Hours: When a tooth is still in the mouth but has been moved, either in or out, or to one side or the other, this is considered an acute injury. Less Urgent — Within 12 Hours: Injuries in which teeth are broken or chipped but not bodily moved from their original position.